We celebrated Lily’s fourth birthday this morning with a run with friends. 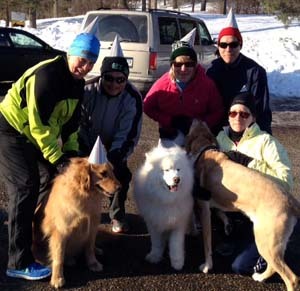 The party hats didn’t make it too long on the dogs, but the rest of us wore our hats for the entire run. We got a few strange looks but when we explained we were celebrating a dog’s birthday, it made all the sense in the world. Friends wear silly hats, sing “Happy Birthday” in the parking lot and know how to make fun of a run together. In a hectic and often unkind world, we can create our own celebrations and moments every day. We have so much more than we often recognize. Today, I am grateful for Lily and Molly and good friends that make life fun, silly and deeply meaningful all at once. Today’s a new day. Get your party hat on! Fun Saturday morning celebrating Lily’s birthday! She did bring the sunshine to the day!